Many advanced developments have taken place in the field of microelectronics. Early 60’s saw the low density fabrication processes classified under Small Scale Integration (SSI) in which transistor count was limited to about 10. This rapidly gave way to Medium Scale Integration in the late 60’s when around 100 transistors could be placed on a single chip.Early seventies marked the growth of transistor count to about 1000 per chip called the Large Scale Integration. By mid eighties, the transistor count on a single chip had already exceeded 1000 and hence came the age of Very Large Scale Integration or VLSI. Today many companies like Texas Instruments, Infineon, Alliance Semiconductors, Cadence, Synopsys, Celox Networks, Cisco, Micron Tech, National Semiconductors, ST Microelectronics, Qualcomm, Lucent, Mentor Graphics, Analog Devices, Intel, Philips, Motorola and many other firms have been established and are dedicated to the various fields in "VLSI" like Programmable Logic Devices, Hardware Descriptive Languages, Design tools, Embedded Systems etc. 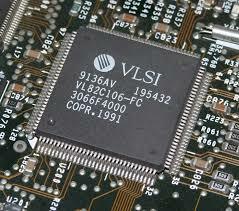 VLSI chiefly comprises of Front End Design and Back End design these days. While front end design includes digital design using HDL, design verification through simulation and other verification techniques, the design from gates and design for testability, backend design comprises of CMOS library design and its characterization. It also covers the physical design and fault simulation. 1. Problem Specification: It is more of a high level representation of the system. The major parameters considered at this level are performance, functionality, physical dimensions, fabrication technology and design techniques. It has to be a tradeoff between market requirements, the available technology and the economical viability of the design. The end specifications include the size, speed, power and functionality of the VLSI system. 2. Architecture Definition: Basic specifications like Floating point units, which system to use, like RISC (Reduced Instruction Set Computer) or CISC (Complex Instruction Set Computer), number of ALU’s cache size etc. 3. Functional Design: Defines the major functional units of the system and hence facilitates the identification of interconnect requirements between units, the physical and electrical specifications of each unit. A sort of block diagram is decided upon with the number of inputs, outputs and timing decided upon without any details of the internal structure. 4. Logic Design: The actual logic is developed at this level. Boolean expressions, control flow, word width, register allocation etc. are developed and the outcome is called a Register Transfer Level (RTL) description. This part is implemented either with Hardware Descriptive Languages like VHDL and/or Verilog. Gate minimization techniques are employed to find the simplest, or rather the smallest most effective implementation of the logic. 5. Circuit Design: While the logic design gives the simplified implementation of the logic,the realization of the circuit in the form of a netlist is done in this step. Gates, transistors and interconnects are put in place to make a netlist. This again is a software step and the outcome is checked via simulation. 6.1 Circuit Partitioning: Because of the huge number of transistors involved, it is not possible to handle the entire circuit all at once due to limitations on computational capabilities and memory requirements. Hence the whole circuit is broken down into blocks which are interconnected. 6.2 Floor Planning and Placement: Choosing the best layout for each block from partitioning step and the overall chip, considering the interconnect area between the blocks, the exact positioning on the chip in order to minimize the area arrangement while meeting the performance constraints through iterative approach are the major design steps taken care of in this step. 6.3 Routing: The quality of placement becomes evident only after this step is completed. Routing involves the completion of the interconnections between modules. This is completed in two steps. First connections are completed between blocks without taking into consideration the exact geometric details of each wire and pin. Then, a detailed routing step completes point to point connections between pins on the blocks. 6.4 Layout Compaction: The smaller the chip size can get, the better it is. The compression of the layout from all directions to minimize the chip area thereby reducing wire lengths, signal delays and overall cost takes place in this design step. 6.5 Extraction and Verification: The circuit is extracted from the layout for comparison with the original netlist, performance verification, and reliability verification and to check the correctness of the layout is done before the final step of packaging. 7. Packaging: The chips are put together on a Printed Circuit Board or a Multi Chip Module to obtain the final finished product. Initially, design can be done with three different methodologies which provide different levels of freedom of customization to the programmers. The design methods, in increasing order of customization support, which also means increased amount of overhead on the part of the programmer, are FPGA and PLDs, Standard Cell (Semi Custom) and Full Custom Design. While FPGAs have inbuilt libraries and a board already built with interconnections and blocks already in place; Semi Custom design can allow the placement of blocks in user defined custom fashion with some independence, while most libraries are still available for program development. Full Custom Design adopts a start from scratch approach where the programmer is required to write the whole set of libraries and also has full control over the block development, placement and routing. This also is the same sequence from entry level designing to professional designing. government jobs are having many vacancies if one holds good technical knowledge in subjects like VLSI, Software, Chemistry, Civil etc. This site is also a good source of information for those who are preparing for the exams. This is the essential moment even have witnessed you're glad and do beholding once more to educate you â€“ its awfully satisfying to appear at that i'm grateful for your steadiness. though in the event that you expected did it for the length of an outrageously extremely clear approach that is prepared to be exceptionally generous. while over all i genuinely elective you and confirmed will involve for an allotment of sends like this. a few particular feeling most. Have you ever wondered how Micro Oven works? What are Wireless Sensor Networks? Do you know how satellites work?